BEFORE YOU POST IN THIS THREAD, THINK TO YOURSELF WHETHER OR NOT I WILL JUST DELETE YOUR POST FOR CLUTTERING IT UP WITH POINTLESS DRIVEL OR STUPIDITY. Feel free to move any of this information wherever. I don't mind if you copy that to a different wiki if you want. Got tired of it after doing the materials only. It doesn't include most 2.0 additions or what Yard items can give materials as a harvest. Route split begins near the end of chapter 3 when the kid asks you to find the chisel. Once that quest is finished, the route is fixed. The priority goes Yuela > Serawi > Emelita. If you don't fulfill either the Yuela or Serawi requirements, you automatically default to Emelita. 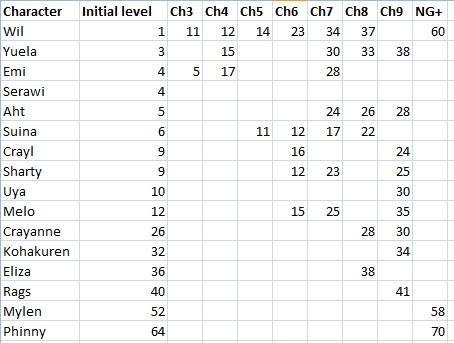 Almost all character events are tied to either level or chapter. If you aren't getting their events, level them (or Wil) up more. Crayanne and Crayl also share events, so you need to level both to trigger them. *These are all about 4-5 quests each, beginning around chapter 4-5 and lasting through a large number of events and half a dozen battles each. **Ragsmuena's starts later (Ch 6 IIRC) and is shorter than the others, but follows the same pattern. **Note that it checks if the items are in your inventory > 0. If you made only one and then equipped/placed them, the quest won't clear. Lily/Leguna/S.Golem require clearing the Extra Stories to become available. *It's awarded in chapter 8, but some of these quests have portions that need to be done by chapter 7. Equippables that modify resistance move the rates up or down along that list. IE, equipping a +Resist Dark accessory on a unit with × Dark resist raises them to absorb. Things in parens are requirements for the quest to begin, not to clear it. * An event at the manor will be generated for Wil's class change, but it's subordinate to all other events there so they need to be cleared first. 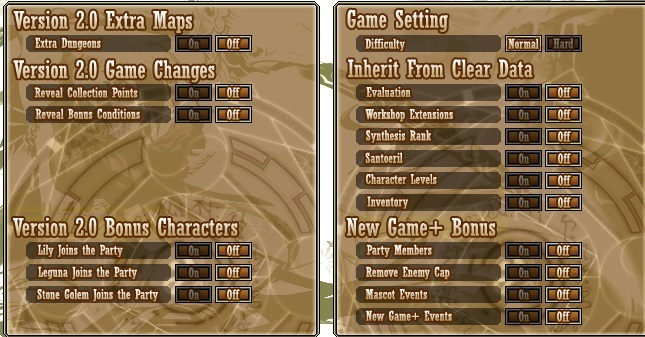 In Emi's route, almost all her endgame stuff is through manor events, so you can get locked out of the Meister event if you wait too long to fulfill all the conditions. Don't waste money, especially on Enhancement, early in the game. Prioritize Price in the store. By about chapter 6, goods will be flying off the shelf even without assigning a clerk. Everything WILL get sold, Price lets you maximize the amount it sells for. And there's always the Deadbeat Dungeon. There's no actual penalty besides the shame of using it. *One of Hannah's quests added by 2.0 is for a rather large array of gems, but 2.0 quests are not meant to be completed on first games anyway. 100% Clear Conditions and Quest rewards should give you more than enough to get by. Your shop probably won't sell much. That's normal. Bows and Crystals are mostly made from cheap materials and sell for a good amount. The shop works decently at this point, but you'll want/need to put decent storekeepers in. You should have enough units to leave one or two behind usually. If you need cash immediately/desperately, farm Treasure Puttetos at the Amurent Forest Free Map (reload map if one isn't present when map begins). Equip a Mill (first one is at Yuma Lake Free Map, Bronze Key needed) for double drops and get 4k-10k of treasure items in a couple rounds (Chests are a rare drop worth 10k each). Use weapons/characters with Pierce to give a chance to kill it in one hit. Fully upgrade Workshop and increase Tools to at least 66 with furniture. That lets you upgrade wood at 1:1. 1 Plywood + 1 Ivy (easy to grow in Yard) = Barrel Pile which sells for 1k (3k+ for upgraded Store specced for Price). ~7 Wood can be farmed from nearly any forest area in one quick trip, so a round trip with a yard full of Ivy furniture nets about 18k in sellable barrels. The goblins on the upper levels of the NG+ mine spawn up to ~6 a turn on certain maps. They have two rare drops worth a base value of 8k or 11k. Selling them at the store lets you at least triple that through furniture (Prices stat) up to around 25k-33k if not much higher. Ragsmuena or almost any NG+ character can easily farm them with +Drop accessories equpped to build up a quick stack of the items. All Tian quests require finishing his materials quests in ch 7 first which like all 2.0 quests, are nigh impossible in first games. *All three of Tian's money quests are VERY bugged. See the bug thread for details. No idea what the calculation is for something mutating into something else. Sorry. Just make ~10 at a time with a high level Workshop and usually you'll get 1 or 2 mutations. This list is pre-Append 2.0 There were a couple more added there, most notably the mutations for Leguna and Golem's artifacts. Yeah, that's all that can mutate. Another mechanic Eushully appears to have kind of forgotten about around 33% through the game. Have a list of the minimum level characters need to be to hit every event by chapter. That list's just transcribed from the Japanese wiki. It's when events can possibly expire, like Serawi's pollution search thing requires Wil level 11 (I think...) and obviously can't come up in ch 4+. Or something. *shrug* Whatever, yo. Just a brief note concerning Gamble Attacks. Each outcome is actually stored as a separate attack in the init files. Roka and Anastasia are NOT immune to it, despite being holy aligned. All other units take 40 HP and 40 SP damage/turn (down to 1 HP/0 SP) when on the ruins squares, regardless of elemental strengths or weaknesses. Some 2.0 maps have similar effects for other elements too. Maybe I'll fill that in later. Unlike battle/level up results, cards are on a strictly RNG instead of a random seed. IE, they can be save scummed. However, the pool of available results per card depends on what 'chapter' the card belongs to. Eu Cards have a slightly different mechanic. There are 8 hardset for the feathers/wings for each mascot (2 each) and 7 that will give a random feather/wing. There are 8 hardset for each of their unique materials (2 each) and 2 Eu cards that give a random mascot material. Colored steels cannot be acquired until the character's second synthesis quest is completed (requires the char to be level 55, then visit Eushully's house to begin). They will not spawn at all until you have completed the quest (no idea how the random ones work though). There are 8 hardset for each of their colored steels and 3 that give a random colored steel. Here is a helpful table that parses it all out for defeating or simple combat. I swear I had noted this somewhere, but apparently not. The calculation for Projectile Defense's damage reduction is 20 +(x*10)% where x is the number of spaces away. IE, a ranged attack from one square away (adjacent) will be reduced by 30%. A ranged attack from three squares away will be reduced by 50%. There's a 2.0 quest requiring killing 100 Greyhounds and then synthing an item. You need materials from a level 90 dungeon for it, so don't bother grinding them unless you can handle it. If you're playing in the Japanese version (ie, some of the names are shared across multiple monsters), then only the lowest class/basic/initial kind of those monsters count. IE, the level 90 Gutehound type in the Phema Mountains do NOT count, nor does the young/puppy version despite them all sharing the same name. Have fun. I'll get the rest of the 2.0 additions later. Someone else can add maps if they want. See here for questions about quests with non-obvious generation/clear requirements. The cliffside church one is wrong. It's at the "Mountain in the sky" map, not "Trail to the Church". Here's the list of item names with Japanese equivilents to assist in searching on Japanese wikis. Bear in mind the translation issues making many of the item names not match up before you start getting uppity about seemingly mistranslated things. An easy example is the set of *姫の首飾り necklaces (2nd level elemental resist). Text box width is 18 characters and "Princess Necklace" takes up 17 characters (all 18 with the space), so there's no choice but to discard the original. "Reyshia Pearl" items suffered a similar fate due to length, but there are many more in there with reasons that I've long since forgotten. Buy the salves in the church for 300 and sell them again in the workshop for more than that. Warning: This does not work with low selling prices, if you're not sure just buy one and look at its selling price in the workshop. With my shop stats: prices 316%, sales 300%, attract 300%, 80 stock. About 130k per 10 days with 06 clerks. About 415k per 10 days with 19 clerks. Last edited by Slaynie on Tue Apr 24, 2012 12:06 am, edited 4 times in total. If you don't know how to find %LocalAppData%, just type it into the Run... dialog, which can be accessed by holding the Windows key and pressing R.
Last edited by Calessa on Thu Mar 29, 2012 2:49 am, edited 1 time in total. If you don't know how to find %AppData%, just type it into the Run... dialog, which can be accessed by holding the Windows key and pressing R.
The saves aren't stored in the roaming profile, but in the local profile. Which is wrong btw, but Eushully did it like that, so... Also, %AppData% already points *inside* the Roaming folder. It's actually in "%LocalAppData%\Eushully\神採りアルケミーマイスター\SAVE". %LocalAppData% is only defined on Windows Vista and newer though; if you're on Windows XP it should be somewhere like "%userprofile%\Local Settings\Application Data\Eushully\神採りアルケミーマイスター\SAVE". However, the "Local Settings" folder name is system language dependent; the translated name is not UI fluff like on Vista+, so you need to check for that too. Some unlisted mutations for the mascot characters. Also I think the eu card list is incomplete. At the end of my first NG+ I had 3 Purple Maid wings, 4 Pink Maid feathers and 5 of the other ones. And since I had already wasted 4 to make their main weapons that means that there are 21 eu cards total for feathers/wings instead of the 15 listed. I remember 2 being in Advent Bay, and one in another lvl 90 dungeon but I have no idea about the rest. To counteract these circumstances, the 'Reaper Bane'' and Faithful Necklace' accessories render your characters immune to death and charm respectively.